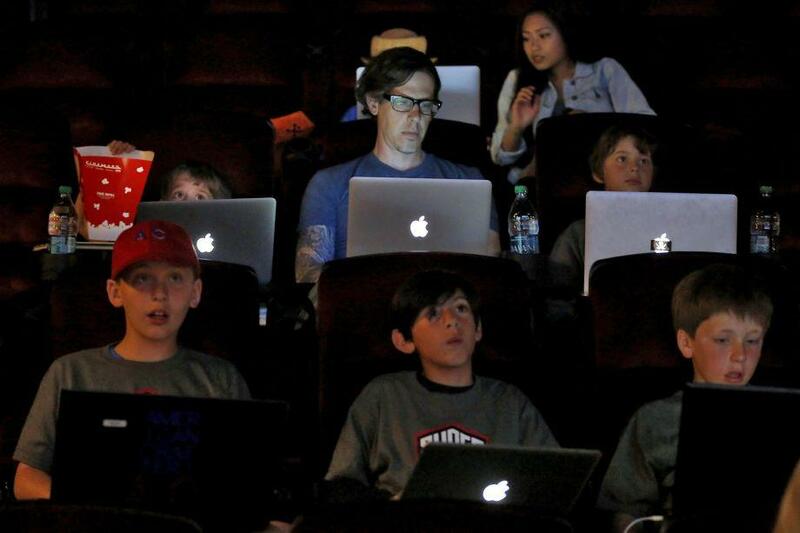 Chris Henley, 40, was one of more than 50 children and parents who took part in a game of Minecraft in a movie theater in Redwood City, California, on Tuesday, June 23, 2015. "SAN FRANCISCO -- Five times, the man accused of killing former Pleasanton resident Kate Steinle was deported to Mexico. Five times he returned. But the efforts of federal immigration officials to detain Francisco Sanchez for a sixth time failed when they turned him over to San Francisco officials, who released him in mid-April. Ten weeks later, Steinle was dead on Pier 14 and Sanchez, 45, a habitual felon, had been arrested for the shooting. "Sheriff's officials let Sanchez go after drug charges against him were dismissed. San Francisco, a "sanctuary city," refuses to enforce federal immigration holds. And as news of his circumstances broke, that pro-immigrant policy -- shared by many other cities -- became embroiled in controversy once again." "California regulators radically revamped the way electricity rates work in the state, approving changes Friday that will raise monthly utility bills for the most energy-efficient homeowners while giving many bigger energy users a break. "The California Public Utilities Commission voted unanimously to narrow the gap between prices paid by people who use very little electricity and those who consume more. Over time, that gap has grown so wide that the most efficient Californians now pay less for electricity than the utilities spend supplying it to them. California has long charged utility customers higher prices for using large amounts of electricity as a way to encourage conservation. And while the commission’s vote will benefit many homeowners who use more than average, the biggest energy “hogs” now will face a new penalty, a “super-user electric surcharge” designed to prod them to conserve." "OAKLAND -- For decades the Henry J. Kaiser Convention Center was the community gathering place for Oakland, hosting school pageants, rock concerts, boxing matches, pro wrestling shows -- even a speech by the Rev. Martin Luther King Jr. on the anniversary of the Emancipation Proclamation. "The city has committed to reopening its historic auditorium on the southwest shore of Lake Merritt, which was shuttered 10 years ago after it became too expensive to operate, and on Tuesday the City Council will take the momentous step of selecting a developer to handle the renovation. But concerned residents are raising a question — how will this new iteration of this old auditorium actually serve Oakland?" "About 50 boys and girls as young as 7 were taking part in a demonstration of Super League Gaming, which has ambitious plans to create the “Little League of video games.”"